Can you measure humility? According to Rosemead School of Psychology professor Pete Hill, the answer is yes. Hill and a team of researchers from four universities across the nation tackled the question with a $1.5 million grant from The John Templeton Foundation from 2013-2016 and produced a tool to measure humility. Now, Hill has received an additional $1.9 million grant from The John Templeton Foundation to continue their research and apply the tool to leadership, looking at how to develop leader humility. Hill is an active researcher in social psychology and the psychology of religion where he has authored approximately 100 articles in peer-reviewed journals and book chapters in addition to co-authoring or co-editing six books. Previously, humility seemed impossible to measure. Hill and his team conducted studies at their institutions and developed a self-measurement instrument to measure a person’s level of humility. Instead of asking questions about humility directly, the measure uses statements focused on key markers of humility such as low concern for status like “To view myself more honestly, I am willing to face things I don’t like about myself.” This approach is believed to be less vulnerable to a positive bias by the respondent. Here, Hill shares about how he came to be known as the man who can measure humility, the next steps in his research, a new study titled, “Project Amazing Grace,” and how he got his start in psychology — it wasn’t planned. How did you originally become interested in the topic of humility? In the late 1990s, Martin Seligman, the president of the American Psychological Association, proposed that in the name of trying to fix people's problems, psychology as a profession had neglected its responsibility in fostering the good in people. This new positive psychology was more than just a secular humanism, for it opened the door to think about how virtues, such as the fruit of the spirit and other Christian qualities taught in scripture, play an important role in human experience. In fact, Seligman, a secular Jewish psychologist, recommended that psychologists become more familiar with the “wisdom literatures” of faith traditions, including Christianity. What a golden opportunity! This was the first time that the integration of Christian faith with mainstream psychology was legitimized by people beyond the Christian community. We had a seat at the table! There was a small but growing network of research-oriented Christian psychologists (and interested non Christians) who saw that psychology was going through the equivalent of a 7.4 earthquake with incredible rebuilding opportunities awaiting. Around the year 2000, about 15 of us got together for a weekend where we laid out a systematic empirical research agenda on topics such as love, compassion, generosity, and the like. One of the participants, June Tangney, was just starting to work on a paper on humility, but thought that the topic was going to be difficult due to measurement issues. I was the one who, perhaps foolishly, thought that we could measure humility and took this up as one of several career challenges. Measuring humility seems ambiguous. How were you able to develop a measurement? By 2012 no critical mass of scientific evidence existed because no theoretically driven, reliable, and valid measures had been developed. Without such measures, there can be no science. Without science, there can be no empirically-based growth in theory nor in application. While measurement is not an exciting topic, it is necessary. 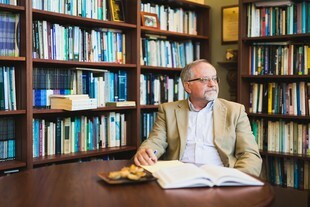 With very generous funding from the John Templeton Foundation, a team of researchers spearheaded at Biola but also consisting of researchers at Duke, Brigham Young University and Baylor, addressed this need and developed several measures of humility, both as a general trait as well as specifically looking at what we call intellectual humility. Most of the measures developed are multi-item self-report measures. But a lingering question remains: how does the humble person report his or her humility? Will their genuine humility keep them from reporting their humility or not? Are they somehow less humble by proclaiming their humility? On the other hand, maybe it is the arrogant persons who are quick to proclaim they are humble? We try to get around this problem by asking what we think are key markers of humility, such as a low concern for status, a ownership of limitations, teachability and an other-orientation regardless of the other’s status in life. It is easy to see many scriptural principles being applied here. We’ve also developed multi-item scales of humility as reported by others whether they be co-workers, friends, or spouses, which we believe are useful measures in and of themselves. These measures also allow us to look at the correlations of self-reports with the reports by others. How do you see others using your tool in the future? Do you think the general population will ever be able to use it? There is a growing social interest in the topic of humility, perhaps advanced even faster due to the political climate from our recent presidential campaigns. The best-seller book “Good to Great” by Jim Collins catapulted interest in the topic in the business world. The HR director at Google said that it was the most important characteristic that they look for in hiring mid-management level people. It appears that the “me first” attitude that seems to pervade our culture is being questioned. While measures designed for research purposes, such as the ones we have developed, do not always match well with the needs of those outside of basic research, I think these measures may have potential for personnel use and personal assessment. For example, the Google HR department may find such a tool useful in making their assessments. What stage is your project at currently? We have developed the measures and have now received another grant, again from the John Templeton Foundation, to begin using those measures to look at humility in leaders. We hope to answer such questions as how does leader humility, or lack thereof, affect others in various contexts: corporate, educational, religious and in the not-for-profit sector, specifically, humanitarian aid settings. Again we are using a multi-institutional team approach headed by Biola University. This three year project just started in January, so there are no results to report just yet. Based on our research, I hope to write a book that is meant for more general audiences by 2020. Can you share more about the grace project you are working on with Robert Emmons and how that came to fruition? Both Bob Emmons, a psychology professor at UC Davis, and I are Christian psychologists interested in the psychological study of religious experience. There are actually quite a large number of psychologists, Christian and non Christian, who are interested in the psychology of religion and spirituality. We noticed that, virtually, no empirical research has been conducted on grace despite the fact that the experience of divine grace is central to faith, especially Christian faith. Now, of course, we can’t study divine grace directly, but we can study human perceptions of divine grace and the effects of those perceptions on people. So, again, we ran this idea by the John Templeton Foundation. They liked the idea in general but thought we needed to develop it further. So, they provided a smaller amount of funding in the form of a planning grant where we have co-authored a paper in a peer-reviewed journal published by the American Psychological Association that is now in press. We are currently writing a proposal, as part of the planning grant, for a larger research project on the study of grace that again will be housed at Biola University. We’ll have to see how that turns out. Dr. Emmons has a special faculty appointment at Biola for the purposes of working with me on this project. Your journey to discovering that you wanted to study psychology wasn't direct. How did you eventually come to realize you wanted to study psychology and what advice might you give to students considering going into psychology? It’s a long story, but here is the short and sweet version of it. I was headed for a career in law, so I thought — when I took general psychology in the spring of my junior year in college. I loved the chapter on social psychology and decided “That’s it, that's what I want to study!” — not knowing what I would do with a degree in the field. Little did I realize then the potential that was in front of me to study in a field that is ripe with implications for the church and for a better understanding of the human side of faith. I also soon learned of the vital need for Christians to be engaged in this study. With a couple of publications during graduate school that stroked my ego (I did not say I was humble, all I said was that I study humility), an academic career began to appeal to me. I’ve never regretted that decision and I love not only the research, but the teaching aspect as well. I’ve always been interested in measurement issues and I am working on an updated volume of a 1999 book, co-edited with Ralph Hood at the University of Tennessee at Chattanooga, that is a compendium of measures in the psychology of religion. So much has happened in the field since 1999 with many new measures developed that we decided it is time to work on a new volume. Ralph and I have also just completed the fifth edition of a textbook in the psychology of religion that should be out in early 2018. At Biola, I serve as director of research and chair of the undergraduate program at Rosemead, so I’m finding myself rather busy these days. Hill is an active researcher in social psychology and the psychology of religion where he has authored approximately 100 articles in peer-reviewed journals and book chapters. He is a past president of Division 36 (Psychology of Religion) of the American Psychological Association (APA) and was elected Fellow of the APA in 1998. He was also the recipient of the Distinguished Member Award by the Christian Association for Psychological Studies (CAPS) in 1998. He has co-authored or co-edited six books: Measures of Religiosity (1999), the Baker Encyclopedia of Psychology (1999), The Psychology of Fundamentalism: An Intratextual Approach (2005), Psychology and Christianity Integration: Seminal Works that Shaped the Movement (2007), and the best-selling psychology of religion textbook The Psychology of Religion: An Empirical Approach (2009) and Psychology of Religion and Workplace Spirituality (2012). Dr. Hill, Please call me reach out to me. My son is interested is studying Pschology.Can you assist him with a scholarship Biola University.? Congratulations on 1.9 million grant form the Jon Templeton Foundation.. Thank you Sir. Dear Sir, I believe I have found the solution to humility in leadership. If you would be interested in this please contact me.